What is the most important thing in life? Is it happiness, your family, your career, your health? All these have a place in answering this question. The true answer may surprise us. It is to prepare well for your death. Nobody can guarantee how your health will turn out. Nobody can give 100% assurance that you and your family will be happy or that you will have a fulfilling career. You can be sure that all of us will die – which is why getting ready for the next life is the most important thing we can do in this life. That there is an after-life is clear from the experience of the Lord Jesus Christ, God’s own Son, who came into the world as a human. He died at the age of 33 but then rose again. He had died in Jerusalem at the hands of the Romans, the world power of the first century, by being crucified. It was a slow and painful death, designed for the worst of criminals. Certified as dead He was buried in a tomb. But He remained there only three days. Against all expectation He emerged from the grave, underlining the words He had previously spoken that ‘I am the resurrection and the life.’ Later He gave further solemn assurance that ‘I am he who lives and was dead, I am alive forevermore.’ His resurrection from the dead is why we should take the after-life very seriously in this life. The Bible is very clear. There is one of two places where we will spend the after-life. One is heaven. The other is hell. Heaven is where God dwells. It is a place of peace and joy and those who dwell there spend eternity in the presence of God. Hell is where we will experience only the wrath of God against sin and will have to live out eternity in a state of misery, loneliness, regret, sadness and pain. The Lord Jesus Christ counseled the people of His day ‘Fear Him (God) who, after He has killed, has power to cast into hell; yes, I say to you, fear Him.’ It is very serious. 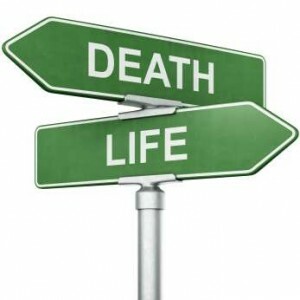 It is the most important issue of life – where will I spend eternity when I die? On one occasion a man asked Paul, a disciple of the Lord Jesus, ‘What must I do to be saved’, in other words, ‘How can I go to heaven, not hell?’ He recognised he needed saving. So do we. We are unfit to go to heaven. None of us have lived according to the holy and just requirements of God. We are guilty of a host of sins, committed in our thought life as much as by outward acts. Pride, uncleanness, jealousy and hatred are the signs that all is not well with us. Besides that we are unable to say we love God as we should. We do not serve Him wholeheartedly. We do not spend our days reflecting upon His goodness and giving Him the worship due to His name. We begrudge Him our prayers if we pray at all. We are fitful at best in our Bible reading. We live much of the time as if there were no God. It is true of us all, as the Bible states, ‘There is no fear of God before their eyes.’ Were we to have a glimpse of the moral beauty and perfection of God, we would own our guilt and the attendant punishment to be just. Sin deceives and flatters us. It diverts our attention from the true state of our soul and promises us all will be well in the next life or even denies there is an after-life at all. There is only one answer in the world to our guilty state before God. It is the death of the Lord Jesus Christ. That death, although it happened as a result of betrayal, false accusation and injustice, was actually according to ‘the determined purpose and foreknowledge of God’. It was a planned death, voluntarily accepted by the Lord Jesus, for it was only possible for sinners to be spared eternal death if another should bear that death in their place. He was our substitute who had no sins of His own to merit punishment, but who was equipped by His perfect righteousness to bear the sins of others. He was able to render to God satisfaction for our guilt and transgression. The transfer of our condemnation meant that His death was more than simply physical death but was also a taste of hell on our behalf. God poured out on His own beloved Son His wrath at sin and the disobedience of His creatures. That He succeeded in bearing our sin is evident from the resurrection. It was the proof that God had accepted His sacrifice. We can therefore have every confidence in Him. Christ’s perfect life, His atoning death and His glorious resurrection make Him worthy of our trust and our total obedience. God’s forgiveness is only to be found by those who seek with all their heart. It is not for the casual inquirer or for those who have merely a passing interest. For us to benefit we must accept our guilt, recognise our transgressions against God and deplore our unrighteousness. We must ask God to forgive us for His Son’s sake and believe upon Him to save us. Here is the answer to the question ‘What is the most important thing in life?’ It is to be ready for death. Without Christ we will perish. But with His forgiveness we are prepared for death – and indeed anything in this life. May the Lord give us understanding and open our eyes to the glory of His Son. Please contact me if you want to know more!